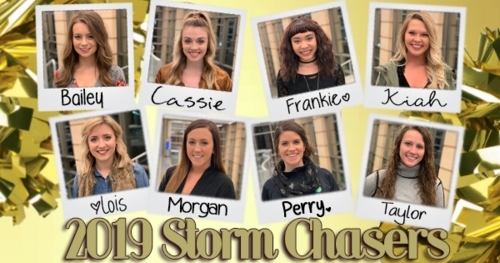 DES MOINES – The Iowa Barnstormers are proud to announce the 2019 Storm Chasers Dance Team. Several talented dancers attended the Storm Chasers Dance Team tryout on Sunday, December 9 at the Wellmark YMCA in downtown Des Moines, with eight being selected to join the team. The squad includes a few familiar faces with six veterans returning from last season and two new dancers joining the team. In addition to performing live at every Iowa Barnstormers home game, Storm Chasers will appear at numerous community events throughout the year. The Storm Chasers will make their first appearance when the Iowa Barnstormers face off against the Green Bay Blizzard in their home opener at Wells Fargo Arena on Saturday, March 9. Kickoff is at 7:05pm. Tickets to the Iowa Barnstormers home opener are available now! Call 515-633-2255 to get yours today! Season Tickets for the Iowa Barnstormers 2019 season are also available now! For as low as $80 per seat, fans can enjoy the action from the same great seat location each game. For more information, call the Barnstormers at (515) 633-2255 or log on to www.theiowabarnstormers.com.